The State Herbarium has chosen Posidonia sinuosa Cambridge & J.Kuo. as the plant of the month for January, 2016 and it is found the Encounter Bay Marine Park. Posidonia sinuosa is a species of seagrass that is endemic to southern Australia and does not occur further East than the SE of South Australia. 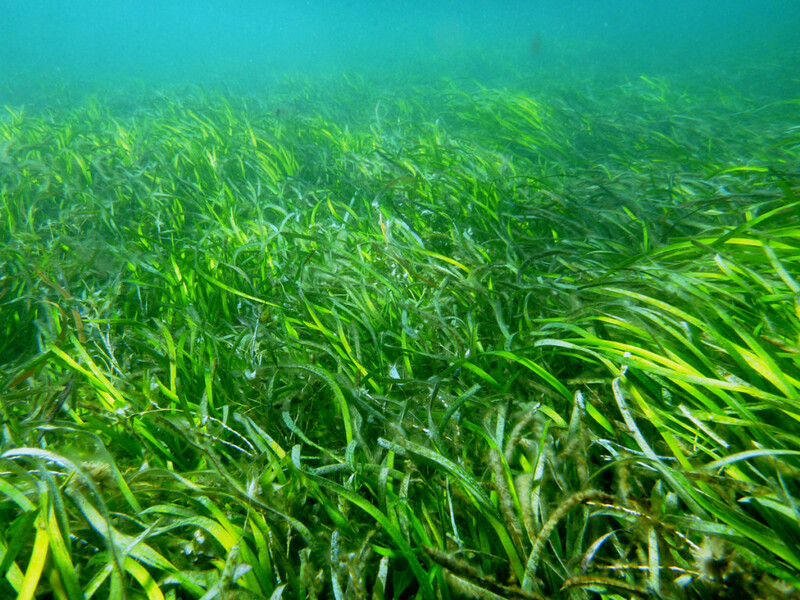 It forms very dense, stable meadows, however this species of seagrass has been listed as Vulnerable to extinction on the IUCN Redlist due to its slow growth rates, infrequent recruitment and highly fragmented habitat across its range. Posidonia sinuosa plants have very long leaves and dense rhizome mats, and as a result the meadows form important habitat for many animals and marine algae which use the plants as a home base. This species of seagrass is typically found in the relatively protected areas of South Australian waters up to around 20 m in depth. Posidonia sinuosa forms floating fruits in summer and along with the fruits of other species of Posidonia, may be often found littered along the beaches at certain times of the year. The Encounter Marine Park occupies more than 3000 km2 and extends from southern metropolitan Adelaide waters around the Fleurieu Peninsula and past the Murray Mouth to the Coorong coast. This region has having a very high diversity of marine plants, both algae and seagrasses. These world class seagrass meadows are nationally and internationally significant in their total area and for providing critical habitat for Posidonia sinuosa. The Encounter Bay Marine Park has an important link to an historically significant collector of South Australia’s marine algae. Jessie L. Hussey (1862–1899) was the first person to collect marine algae for scientific research from the biodiversity rich Encounter Bay region. Jessie’s collecting spanned 1893–1899 and is essentially the first survey of the marine algae of that region. Jessie’s specimens were sent to the leading experts of the day and reside in prestigious national and international herbarium collections. Whilst Jessie’s work has remained largely undocumented, artist and Technical Officer at the State Herbarium of South Australia, Lisa Waters has been researching Jessie’s life and work. Lisa believes that full documentation of the algal specimens Jessie collected will provide an invaluable opportunity to create a historical baseline of the beautiful and biodiversity rich Encounter marine region. The significance of this historical link to the Encounter Bay Marine Park is that we can recognise the long term presence of the species of marine algae that are important in the area. Jessie L. Hussey would be a great supporter of this new reserve system. This entry was posted in The Plant Press on 1 February, 2016 by Michelle.